It's Friday, it's payday, or you're halfway to your next payday. Life is good right now. $10 off $50+ or $20 off $100+ at MACcosmetics.com? Well that's a rarity. FREE SAMPLE WITH PURCHASE?! Sold. Today just got even better. In celebration of MAC's fabulous new website makeover, they've decided to offer a *rare* coupon code for online purchases. Now through 6/22 by entering MACFAN1 at checkout, you can get $10 off of orders $50 or more. I also heard through the grapevine [forgive me if I'm wrong] that you will get an automatic $20 off of orders $100 or more, no code required. Assuming this expires 6/22 as well. You must have an online account with MAC to be eligible for both - so be sure to already be signed in before adding to your cart. Don't have an account? You can sign up for free here. 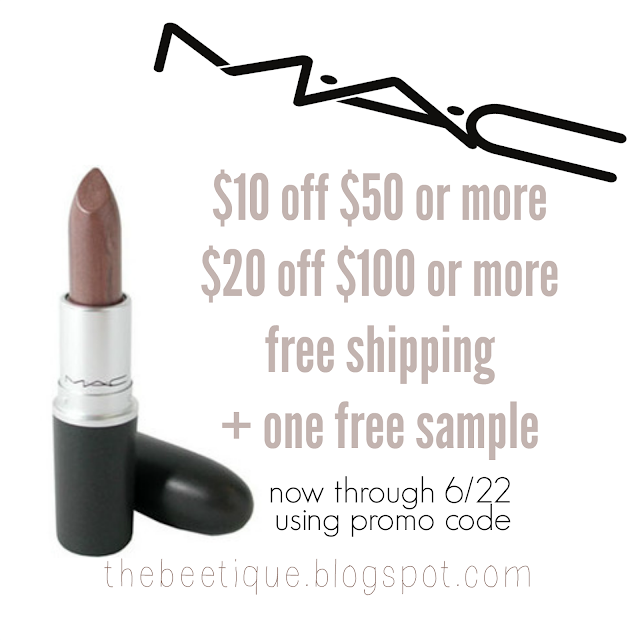 Free shipping: MAC offers free shipping on all orders, and every so often they'll offer free 2 day shipping as well. Who would've thought? Go crazy! Free sample: About time! When you're ready to check out, be sure to take note of the three options of samples to choose from on the right side of the page. You are so welcome!! And thank you to the fabulous Nouveau Cheap blog for passing on the news to all readers.